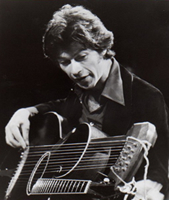 Robbie Robertson is a Canadian singer-songwriter, and guitarist. He is best known for his membership as the guitarist and primary songwriter within The Band. He was ranked 78th in Rolling Stone magazine's list of the 100 Greatest Guitarists of All Time. The Band has been inducted to the Rock and Roll Hall of Fame and the Canadian Music Hall of Fame. As a songwriter Robertson is responsible for such classics as "The Weight", "The Night They Drove Old Dixie Down", "Up On Cripple Creek", "Broken Arrow" and "Somewhere Down the Crazy River", among many others. At an early age Robbie began taking guitar lessons from a cousin, and gradually began composing his first songs. As time wore on, his musical interests evolved from country to big band to rock, and he eventually dropped out of school to pursue a career as a performer. In 1958, he hooked up with rockabilly star Ronnie Hawkins' backing band the Hawks, joining fellow sidemen Levon Helm, Rick Danko, Garth Hudson and Richard Manuel. After remaining with Hawkins through 1963, the Hawks began working on their own; they soon came to the attention of Bob Dylan, and became the support unit on the singer's now-legendary 1965-1966 world tour. Continuing their affiliation with Dylan, the group, renamed simply the Band, went on to become one of rock's seminal acts; propelled by Robertson's acute, evocative examinations of American mythology and lore, they made a series of seminal LPs, including 1968's Music From Big Pink and the following year's self-titled masterpiece. The Band dissolved on Thanksgiving Day, 1976 following an all-star concert filmed by director Martin Scorsese and later released as The Last Waltz. The project marked the beginning of Robertson's long affiliation with Scorsese, as well as an interest in dramatic acting; in 1980, Robertson produced and starred in Carny, co-starring Jodie Foster and Gary Busey. Also in 1980, he composed the score to Scorsese's brilliant Raging Bull, and continued to confine his musical activity to the film medium for the next several years, later working with Scorsese on the acerbic 1983 satire King of Comedy and 1986's The Color Of Money, the sequel to The Hustler. Finally, in 1987 Robertson released his self-titled solo debut, which included guest appearances from onetime Band mates Danko and Hudson as well as U2, Peter Gabriel, Daniel Lanois and Gil Evans. Storyville a conceptual piece steeped in the sounds and imagery of a famed area of New Orleans, followed in 1990. On his last two albums in 1994, Robertson returned to his roots, teaming with the Native American group the Red Road Ensemble for Music for The Native Americans, a collection of songs composed for a television documentary series. Contact From the Underworld of Redboy followed in 1998. Now, with How To Become Clairvoyant, he takes on his rock heritage, delivering his first-ever song about leaving The Band, the evocative "This Is Where I Get Off." In 1995, in Rome, Robertson headlined an annual Labor Day concert festival with support acts Andrea Bocelli, Elvis Costello, and Radiohead. In 1996, Executive soundtrack producer Robertson heard a demo of Change The World and sent it to Clapton as a suggestion for the soundtrack to Phenomenon, starring John Travolta. He then enlisted Babyface to produce the track. Change the World won 1997 Grammy Awards for Song of the Year and Record of the Year. In 1997, Robertson received a Lifetime Achievement Award from the National Academy of Songwriters. In 2000, David Geffen and Mo Ostin convinced Robertson to join DreamWorks Records as creative executive. Robertson, who persuaded Nelly Furtado to sign with the company, is actively involved with film projects and developing new artist talent, including signings of A.i., Boomkat, Daniel DeBourg, eastmountainsouth, and singer-songwriter-pianist Dana Glover. February 9, 2002, Robertson performed "Stomp Dance (Unity)" as part of the Opening Ceremony of the 2002 Winter Olympic Games in Salt Lake City, Utah. At the 2003 commencement ceremonies at Queen's University in Kingston, Ontario, Robertson delivered an address to the graduating class and was awarded an honorary degree by the university. In 2003, Robertson was inducted into Canada's Walk of Fame. In 2006, Robertson recorded with Jerry Lee Lewis and Samuel Bidleman on Last Man Standing on the track "Twilight". That same year, he received the Governor General's Award for Lifetime Artistic Achievement. On July 28, 2007, at Eric Clapton's Crossroads Guitar Festival in Bridgeview, Illinois, Robertson made a rare appearance on stage and played briefly. Also in 2007, Robertson accepted an invitation to participate in Goin' Home: A Tribute to Fats Domino (Vanguard). With the group Galactic, Robertson contributed his version of Domino's "Goin' To The River". According to an article in the February 9, 2008 edition of the Winnipeg Sun, Robertson is said to be working with Eric Clapton on an album of new material. From Mojo magazine's May 2010 interview, Robertson claimed he was writing an autobiography. 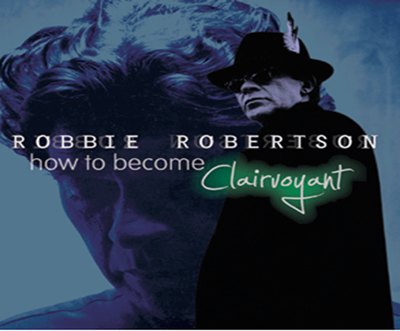 On April 5, 2011, 429 Records released How To Become Clairvoyant, Robbie Robertson's fifth solo album and his first record in more than 10 years. Guitar virtuosos Eric Clapton (who co-wrote three tracks with Robertson), Tom Morello and Robert Randolph guest on the album, which Robertson co- produced with Marius de Vries. How To Become Clairvoyant also features Steve Winwood and Trent Reznor as well as vocalists Angela McCluskey, Rocco Deluca, Dana Glover and Taylor Goldsmith of Dawes. Bassist Pino Palladino and drummer Ian Thomas lay down the groove throughout.